ElopeNewYork.com: Planning ahead: Should you book a spot in Central Park? Planning ahead: Should you book a spot in Central Park? 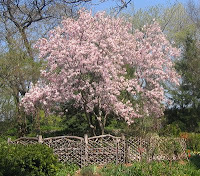 Here is the Shakespeare Garden in spring. 1) If it is a busy Saturday - try to book your spot a month ahead. The permits are $25. Your permit will allow you to wave it at other couples (and photographers) who have chosen the same location for their event. Unlike the Conservatory Garden, which is private and has more staff, there will probably not be a ranger or park employee around to ask other people to move - but you can show your permit to anyone who is occupying the space, and take possession of it for your ceremony. 2) If you are a big group, e.g., a family group of over 20, especially if they are arriving in the park from different directions and travel, parking and transit may be a problem, consider booking. You can get there early, clean up the hamburger wrappers, and check out the environment. Note: if people are using the space, for a picnic, or reading, or resting, inform them politely that you have the area booked for a wedding at a specific time. Be nice. People will always cooperate, if you give them time to move on. Please don't be abrupt or ask them to move TOO LONG before the actual ceremony - they'll be happy to leave when it looks like something is really happening. You don't need to show your permit unless questioned. 3) For an elopement with a small group of witnesses -- especially on a non-peak time, it's sometimes better to have a couple of spots in mind, to meet at a gate, and just wander into the park with your officiant and guests, and find your perfect space. Remember, all the BIG spots are VERY POPULAR - and full of people. So Strawberry Fields, the Bethesda Fountain, Bow Bridge, the Ladies Pavilion, will more than likely have people in them. Sometimes it's better to find a spot LOOKING at Bow Bridge (from the little island over the bridge, perhaps) or somewhere above the ramble in the northern area, and be more private. Central Park is bigger than Monaco. You can always find a spot. Prospect Park is also enormous, less populated, and has lots of lovely places.